Captain George Taylor Richardson, circa 1914. 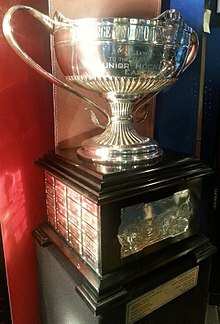 The George Richardson Memorial Trophy was presented annually from 1932 until 1971, by the Canadian Amateur Hockey Association. It represented the Eastern Canadian junior hockey championship, and a berth in the Memorial Cup final versus the Abbott Cup champion from Western Canada. The George Richardson Memorial Trophy was retired in 1971, when the Memorial Cup became a round-robin series between the winners of the three major junior hockey leagues in Canada; the Western Hockey League, the Ontario Hockey League and Quebec Major Junior Hockey League. Trophy was donated by James Armstrong Richardson Sr. in April 1932, in memory of his brother Captain George Taylor Richardson Chev. L.H. (September 14, 1886 – February 9, 1916). He was a Canadian ice hockey player, businessman, philanthropist, and later a soldier. Richardson was considered one of the finest amateurs of his time. He played for the Queen's University team that challenged the Ottawa Hockey Club for the 1906 Stanley Cup, and played for the 14th Regiment of Kingston team won the Ontario Hockey Association title, and the J. Ross Robertson Trophy in 1908, and the 1909 Allan Cup. He was enshrined in the Hockey Hall of Fame in 1950. Richardson was part of a prominent Kingston, Ontario family that owned and operated James Richardson & Sons. He joined the Canadian Expeditionary Forces in World War I, and died in action in Belgium, and was created a Chevalier of the Legion of Honour of the French Third Republic. The Eastern Canada junior playoffs were open to the champions from five respective regions. However, league champions did not always participate, and the format varied depending on the number of teams. In the late 1950s, the Junior Canadiens participated as an independent team. Ontario-based teams won the most championships. No team from the Maritimes ever won the George Richardson Memorial Trophy, and the last time a Northern Ontario team won it occurred in 1937. The final Richardson Cup in 1971 between the Quebec Remparts and the St. Catharines Black Hawks was controversial due to violence and off-ice disputes causing its abandonment before completion. The series was played when tensions were high between Anglophone Canadians and Francophone nationalists, and featured future NHL stars Guy Lafleur and Marcel Dionne. The series was intended to be best-of-seven, but ended after five games with the Remparts leading three games to two. St. Catharines refused to return to Quebec City due to violence that occurred after game four, and threats from the Front de libération du Québec against its players. The CAHA declared the series over when no further compromise could be reached. 1969–70 Montreal Junior Canadiens team, with the George Richardson Memorial Trophy displayed on the lower left. List of champions and finalists of the George Richardson Memorial Trophy. Number in parenthesis denotes total number of championships won. ^ a b Podnieks, Andrew (2005). Silverware. Bolton, Ontario: Fenn Publishing. p. 42. ISBN 1-55168-296-6. ^ "History of hockey and the Canadian military". Veterans Affairs Canada. 2017-03-29. Retrieved 2018-01-11. ^ "Captain George Richardson". Kingston & District Sports Hall of Fame. Retrieved 2018-01-08. ^ "War hero George Richardson". Original Hockey Hall of Fame and Museum. Retrieved 2018-01-11. ^ Kennedy, Patrick (2015-01-16). "Kingston & District Sports Hall of Fame: George T Richardson will be inducted 99 years after his death in the First World War". The Kingston Whig. Retrieved 2018-01-08. ^ "Richardson, George — Honoured Member". Legends of Hockey. Hockey Hall of Fame. Retrieved 2018-01-08. ^ "Richardson, George Taylor". Queen's Encyclopedia. Queen's University. Retrieved 2018-01-11. ^ "Circumstances of Death Registers, First World War". Circumstances of Death Registers, First World War. Library and Archives Canada. Retrieved 2018-01-10. ^ "In memory of Captain George Taylor Richardson". Canadian Virtual War Memorial. Veterans Affairs Canada. Retrieved 2018-01-09. ^ a b Lapp, Richard; Macaulay, Alec (1997). The Memorial Cup. Harbour Publishing. ISBN 1-55017-170-4.